Let’s be honest the default pre-installed Xcode themes do the job but over time aren’t as useful, and what I mean by that is; eyesight. I suffer from astigmatism and like many of you I spend most of my work day dreaming in code within Xcode, and at times I end my work day with teary eyes. Now, let me make it clear that I do use macOS “dark mode” and f.lux as well to help ease things a bit. Aside from eyesight, I also like to customize my development environment; but don’t we all? Within the UserData folder if you don’t see the FontAndColorThemes folder, go ahead and create it. Now, open Xcode and under Preferences – Fonts & Colors: You should be able to select the theme that you just installed. If you’re feeling lazy; ha. You’re going to love this! Step One: Download through the Mac App Store ThemeInstaller, $0.99. Step Two: Open ThemeInstaller app once it finishes downloading, and drag your theme file within the app. 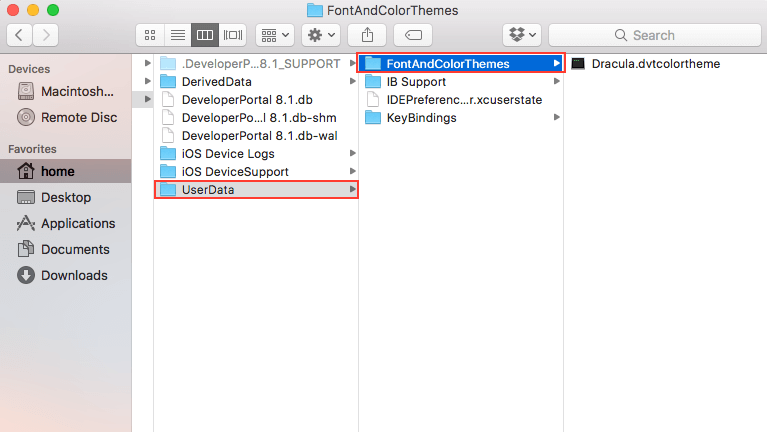 Step Three: Open Xcode and under Preferences – Fonts & Colors: select your theme. Just for fun you can watch this YouTube video how to do it! There you have it, enjoy and happy coding!